Love comes along when you least expect it. That's what Duncan Taylor's sister, Scout, tells him. Scout has everything Duncan wants--a happy life with a wonderful husband. Now that Seattle has made gay marriage legal, Duncan knows he can have the same thing. But when he proposes to his boyfriend Tucker, he doesn't get the answer he hoped for. Tucker's refusal is another misstep in a long line of failed romances. Despairing, Duncan thinks of all the loving unions in his life--and how every one of them is straight. Maybe he could be happy, if not sexually compatible, with a woman. When zany, gay-man-loving Marilyn Samples waltzes into his life, he thinks he may have found his answer. Determined to settle, Duncan forgets his sister's wisdom about love and begins planning a wedding with Marilyn. But life throws Duncan a curveball. When he meets wedding planner Peter Dalrymple, unexpected sparks ignite. Neither man knows how long he can resist his powerful attraction to the other. For sure, there's a wedding in the future. But whose? The beginning of the book gave me the feels for Duncan. With legalized gay marriage, Duncan gets wedding fever. Having been in a relationship for three years, he pops the question, only to get a no... this is the catalyst for Legally Wed.
After having a disturbing dream where he's at the altar 'here she comes,' getting married to a woman, Duncan decides he will marry one – gay or not. As soon as this premise hit the pages, I feared what would come next... an MF novel featuring a gay character and his new bestie girlfriend. I just hoped it wouldn't take up the majority of the pages – it did. the second book, where she rubbed me all kinds of wrong, and her portrayal was no better in Legally Wed. CRAZY OTT. It's Duncan's journey as he solidifies a friendship with Marilyn, while her voice is also narrated on the pages. While there were plenty of sweet, endearing, and humorous interactions between the two, I couldn't help but feeling anything but hopelessness. Duncan and Marilyn are settling... for each other. How is this inspiring? It just made me feel sad. This is a romance novel featuring little romance, as two people meet and become friends, and all I could think was how delusional they were being. How hyper-focused on being married instead of what the union represents. Romance is more fantasy, sure. Marriage is reality, but there should be love in a marriage, not just because you're ready to be married and doubt you'll ever find Mr. Right. How hopeless. Sad. Settling for less than you deserve. No matter how banterific Duncan and Marilyn were together, this was disturbing, delusional, and not at all Feel-Good romance. Peter – the wedding planner. Yes, after the halfway mark, Duncan's 'the one' finally reveals himself, but there aren't many scenes where they interact with one another in a romantic sense, and I don't just mean sexually (between-the-sheets action is very light, not that I'm complaining). There is no build-up or tension, as the foundation of the novel was given to Marilyn and Duncan's relationship, with their love interests thrown in at the end. Legally Wed features a budding friendship between two hopeless souls, where the romance and the love interest takes a backseat, to the point I felt nothing on that end emotionally. Yes, Marilyn and Duncan together were humorous. This book features a friendship, and a MF and MM romance riding in at the end. As I'm reading this in the Feel-Good True Romance bundle, on its own, I could have taken Legally Wed at face-value. But it was not 'Feel-Good' or 'True Romance' in nature. Yet again, the majority of the focus was on a female narrator, leaving the relationship development between the two male love interests to take a backseat. In the past, when I'd hear MM Romance readers say how much they did not like F in their MM, I used to scoff. Now I get it. I apparently had never come across MM featuring F narrators and MF romance before. Two in a row in this bundle, sharing the same narrator, and I hope the last book doesn't. This is a rather odd book to define – I think it is misnamed as an MM romance, as the majority of the book is about an openly gay man deciding that he is better off marrying a woman. The interactions between him and Marilyn are amusing, but in a strange context. I found the book to be based on an interesting idea, and enjoyed reading it, but I think that the twist could have been resolved more quickly and the relationship between Peter and Duncan given the coverage that it truly deserved. It probably did not help that I found Marilyn to be the type of person who I would go to great lengths to avoid. An interesting addition to the series, even if rather sad. 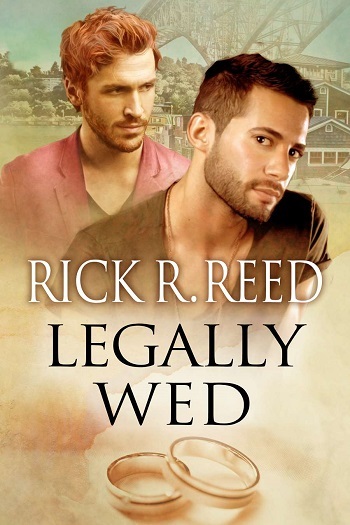 Reviewers on the Wicked Reads Review Team were provided a free copy of Legally Wed by Rick R. Reed in the Feel-Good True Romance bundle to read and review.